The Milk Carton Kids & Friends. Join The Milk Carton Kids and their musical and comedy friends on the festival's closing night for a special one-of-a-kind old fashioned variety show!Waltzing into disaster and its aftermath, The Milk Carton Kids' "All the Things That I Did and All the Things That I Didn't Do" is available now on ANTI- Records.The new project marks the first time that acoustic duo Joey Ryan and Kenneth Pattengale have brought a band into the studio with them. "We wanted to do something new," Pattengale says. "We had been going around the country yet another time to do the duo show, going to the places we'd been before. There arose some sort of need for change. ""Musically we knew we were going to make the record with a bigger sonic palette," says Ryan. "It was liberating to know we wouldn’t have to be able to carry every song with just our two guitars. 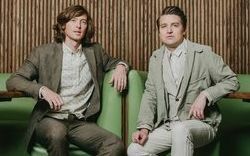 "Since their last studio album, "Monterey" (ANTI- 2015), life has changed dramatically for The Milk Carton Kids. Pattengale has moved to, and is now producing records in Nashville. Ryan is now the father of two children and works as a producer on "Live from Here with Chris Thile," the reboot of "A Prairie Home Companion." A break from years of non-stop touring, Ryan says, has yielded "space outside of the band that gives us perspective on what the band is. "But it's not just the addition of the band here that creates something new. National politics left Ryan feeling disoriented and mournful. Pattengale’s relationship of seven years ended, and he found himself unexpectedly needing surgery for cancer. (He is cancer-free now, and accidentally broke his cigarette habit in the process. )Though they didn't approach the new album conceptually, a theme of shattered realities began to emerge out of the songs that sparked to life. Recent events provided a bruising background for the record, yet the project is somehow bigger than any personal grief. Two-part harmonies ride acoustic guitars high above the haunting landscape created by the presence of the band, as if Americana went searching for a lost America.Produced by Joe Henry and engineered by Ryan Freeland, "All the Things That I Did and All The Things That I Didn't Do" was recorded in October 2017 in the Sun Room at House of Blues Studio in Nashville. Musicians who joined them there included Brittany Haas on violin and mandolin, Paul Kowert and Dennis Crouch on bass, Jay Bellerose on drums, Levon Henry on clarinet and saxophone, Nat Smith on cello, Pat Sansone on piano, mellotron, and Hammond organ, Russ Pahl on pedal steel and other guitars and Lindsay Lou and Logan Ledger as additional singers. Mixed by Pattengale, the album was mastered by Kim Rosen.